Unless you're a bean hater (and I'm aware that there's a whole army of you out there) - beans on toast is pretty much the impossible to f*** up dish - and it is a "dish", let's not argue about that. Previously I have pimped my beans by adding cheese. A couple of fried eggs nestled safely upon the bosom of the toast, before being drenched in beanage, is also a path worth taking. 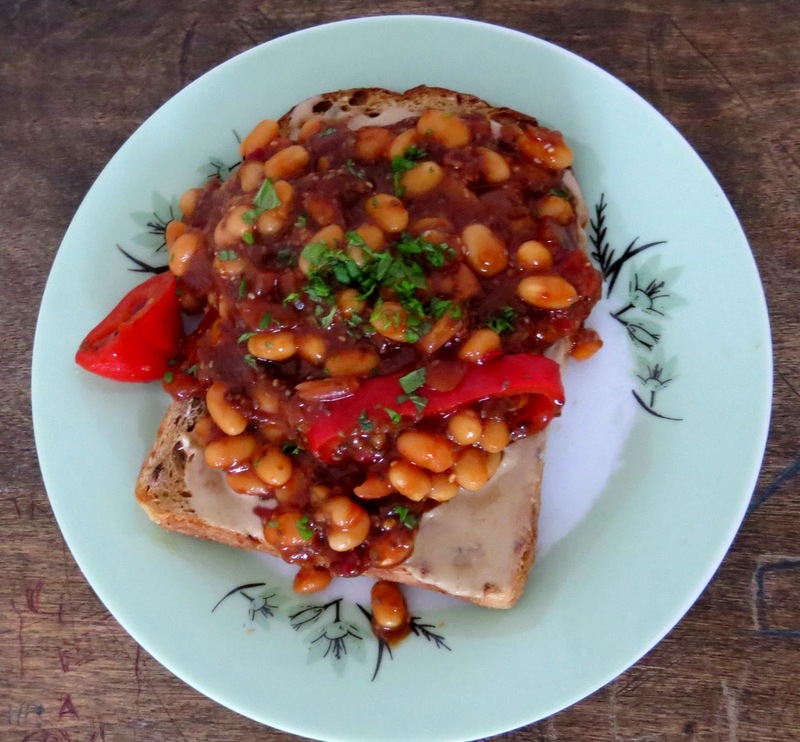 Yesterday though, I made, what I can confidently declare as, the best beans on toast ever. And this plate of food is entirely vegan. If you're not following a vegan diet, by all means, pursue the cheese and egg, but omnivores, I promise you - this is perfect as it is. This recipe takes bean juice to a whole new level, with chia seeds which absorb a lot of the water and create a viscous, thick sauce, and plenty of crunch from lightly fried red pepper. There's heat from chillies, and the unmistakeable flavour of tamarind. Usually I would have served this on a couple of slices of sourdough - but when I took it out of the bread cupboard there were a few tell-tale specks of mould, so this automatically becomes seagull fodder I'm afraid. Here I've just used a slice of seeded granary bread instead, which is still tasty! 1 portion of vegan friendly baked beans - I use Heinz reduced sugar and salt baked beans. Only you know what "1 portion" means to you, so I'm not giving you a weight! A generous glug of olive oil 1 medium tomato, chopped. 1 red pepper, chopped. I used a Remano pepper today as that's what I had. Half a white onion, finely chopped. 2 cloves of garlic, crushed. 2 teaspoons of finely chopped red chillies. 1 teaspoon tamarind concentrate. A handful of chia seeds. Salt and Pepper to taste. 1 or more slices of bread. Tahini for spreading. Chopped coriander for dressing. Add the tamarind and stir to fully combine. Pour in the beans and stir until heated through. Add the chia seeds and stir until they've absorbed most of the runny bean juice and you're left with a thicker, gravy-like sauce and then season to taste with salt and pepper. Spread your bread with a good layer of tahini and then spoon on beans.